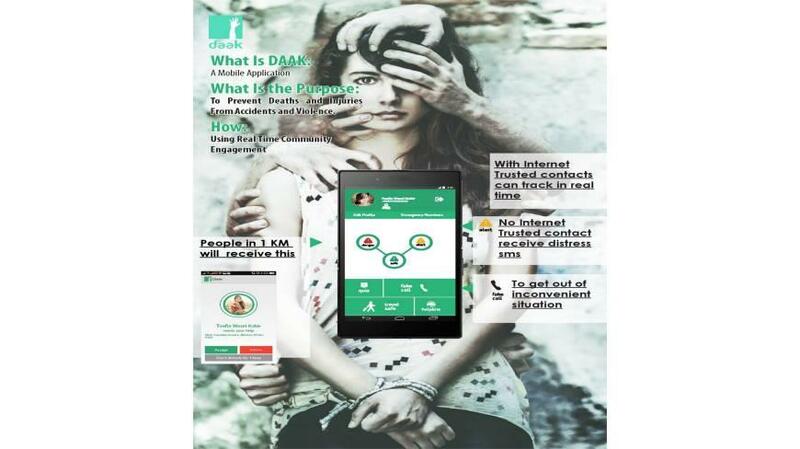 Daak made its appearance as a personal safety app that has a social angle to it. It is a bold answer given to the violent threats that are prevalent everywhere. Today when the issue of personal safety has outgrown beyond all proportion, any individual is susceptible to a either an incident of harassment or a sudden blow of extortion going to an extent of physical assault. At that point of confrontation with such a situation, it becomes difficult to make a call or even send off messages to anyone. 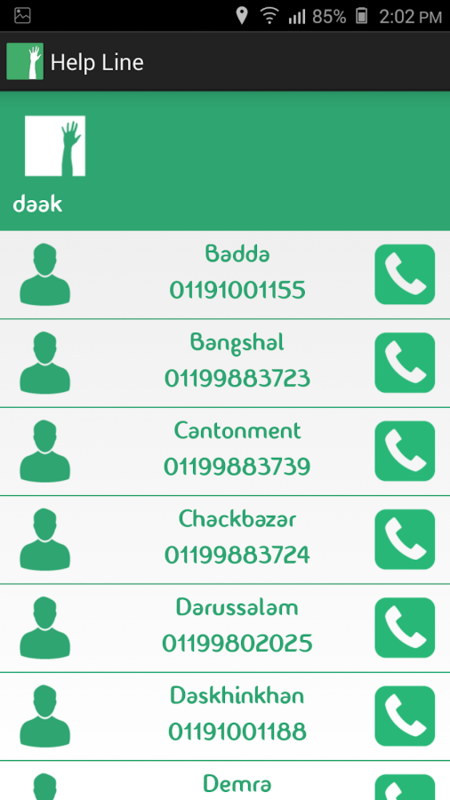 To find a solution to such kind of a situation, which we all are quite concerned about, Rupam IT Ltd, a firm from Bangladesh, came up with a solution with an app named "Daak" which is a Bengali term for the word "Call". Daak – a mobile application developed by Rupam IT Limited, which is a popular IT startup in Dhaka. 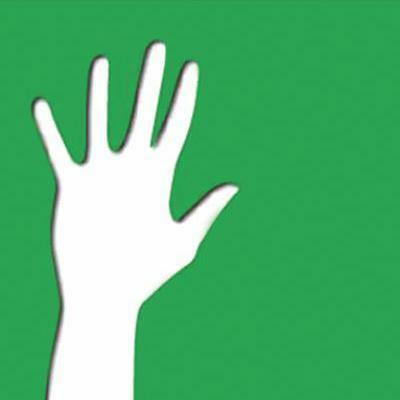 The app aims to provide an immediate solution to prevent the propensities of sexual harassment that takes place every now and then against women. It especially focuses on the power of community to do so. Zamil Rashid, the founder of RITL took the initiative to take up a strong step ahead towards a safer generation where every user can protect themselves with a primary tool of security while the criminal minds would be hopefully subdued as the police force is integrated with the app. Daak as an app is based on simplicity so that it becomes easy for the user to operate in emergency situations. The app will occupy only about 5 MB of your device. While you download it will prompt for a sign-up. But you can also access it through your Facebook and Google+ accounts. Once you launch the app, the next step will be adding up the emergency contacts. It has also integrated helplines from every police station in Dhaka. The app will be in "safe" mode in normal situations and in critical situations, "danger" or "alert" button need to be pressed to reach the emergency contacts. Daak is comparatively a lightweight application to that of the regular apps that are running worldwide of the similar category. Zamil has explained that to ensure the best usability they have taken inspiration from the personal security apps that are famous in the advanced countries to build up a security system that works positively and ensure the primary level of security to its users. Daak is developed as a community powered mobile application. After the app installation process is over in the mobile, one can send text messages to their selected contacts, and even to the nearby app users for help. The best feature because of which Daak has achieved popularity is that it works offline too. It has listed down all the local administrations' communication numbers and its alarm works in hand with the local law enforcers if it is within a 1-kilometer radius distance. When used online, the selected emergency contacts will receive the real-time map location of the user. Daak is made both offline and online. While used online, Daak issues real time updates of the user's whereabouts with the help of Google Map that reaches fast to your family and friends. One can also choose to start a conversation with people around and let them know about the situation. It can also be done in a similar fashion while using the app offline through SMS tracking feature. Daak has been ideally crafted to respond to any kind of emergency situations, but mostly it is right now doing a good job in helping the women race because of its useful features like Fake call. 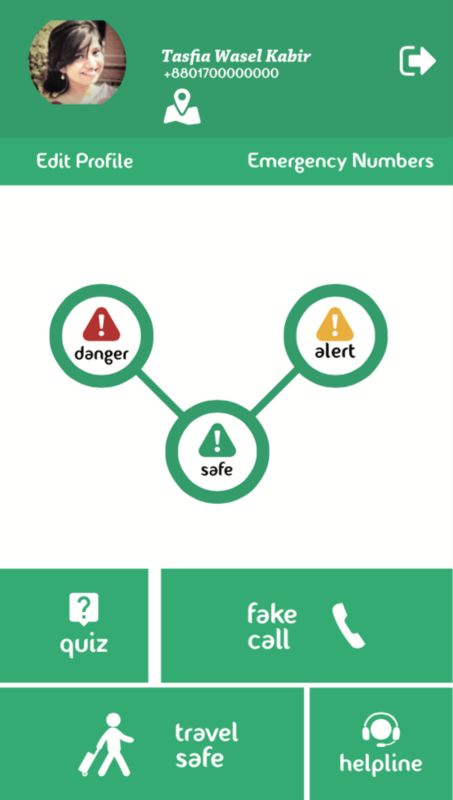 The Fake call feature makes a fake call to the user, which can keep the offenders at bay and the user can continue to act out the one-sided conversation till she reaches herself to a safer place. The Follow Me feature of this app sends text messages to the emergency contacts if the user finds that the driver is diverting his way from the user's chosen road. The GPS will let the contacts find the user's location so that they can follow the vehicle in which the user is traveling. The Quiz is another feature that creates awareness by imparting knowledge on the self learning techniques to handle a difficult situation. This way the weaker section develops a kind of alertness which is the most important thing required for survival. The Helpline is an easy access to the national database where the user can access anyone. The App is lightweight and doesn't occupy much memory space of the device. It is a well planned application that has integrated the police and other administrative offices that increases the weight and gravity of the application. The App works both offline and online. So the users can take the advantage of the app even in remote locations where the internet might not get good coverage. The app has a very effective set of features that increases the general awareness of the user and that is indeed an appreciable feature of an app as that would keep the users ready and alert and would not allow them to be off-guard. The app has a serious motif and it is focused well on its purpose. The app has addressed the current issue of women security with a serious and sincere approach which is quite inspirational. To tell the truth, I don't feel anything negative about this app since this is exactly what I was looking for. But to make it a regularly successful app, it needs to go ahead towards a few modifications. Right now the set of features are not much user-friendly. Sometimes it might be difficult to find out how the hotkeys work. For instance if a phone does not have a physical home button it will not work with the hotkeys. It also needs to have a a set of user manual or a set of instructions on how to use the features of the app. An app like Daak is a really appreciable work which has really brought technology to address an issue which has upset the entire society in countries like India and Bangladesh. It has done a praiseworthy attempt of assembling all the good features of safety tools that the advanced countries are working with. That was a step taken forward to achieve a safer society for women and all the common citizens as a whole. The app can be downloaded from the Google Play Store now and in India we need something similar or better to come in every hand to walk towards a safe and secured place to live in. Personal Safety Apps in India: The Current Scenario.